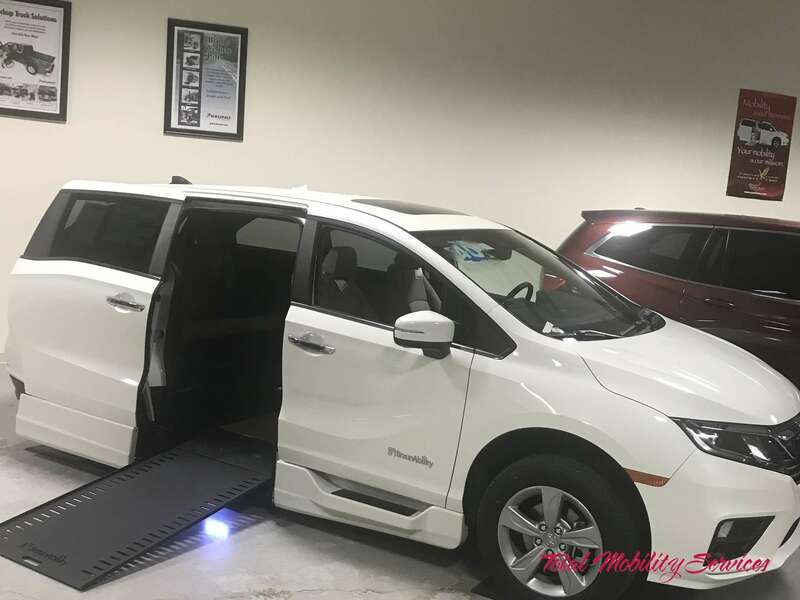 Built on the 2018-2019 Honda Odyssey, the BraunAbility® Honda Power lnfloor is sure to be a customer favorite! With an extended cabin for improved interior maneuverability and an all-new infloor ramp system, entering and exiting is easier than ever for wheelchair users and ambulatory passengers. The bold lines of the chassis integrate seamlessly with BraunAbility interior and ground effects for a wheelchair accessible vehicle that looks as great as it performs. You'd expect nothing less from the Most Trusted Name in Mobility. The floor is lowered from the toe pan to the rear axle. The OEM Honda power door operator opens the sliding door at the touch of a button. The powerinfloorrampstows out ofsightand out of mind until needed and allows ambulatory passengers to enter and exit without deploying ramp. Custom Ground Effects- Adds stylish lines and enhances smooth OEM appearance. The vehicle features a kneeling system to make boarding even easier. An actuator lowers the rear suspension while the door opens, which reduces the slope of the automatic ramp. The system can be de-activated when desired with the on/off switch. Control of the vehicle's accessible features is built into the Honda keyfob remote. Quick-touch operation assures simple, convenient and reliable operation. ​Adds comfort for backseat passengers and folds away when not in use. ​The spare tire is now stored below the rear cargo area. Third row roll-and­tumble seats fold forward to offer additional cargo space when needed. A visit to our indoor showroom in Pennsylvania and Maryland is a great way to view and try our products. We offer an extensive selection of new and used wheelchair accessible vehicles.